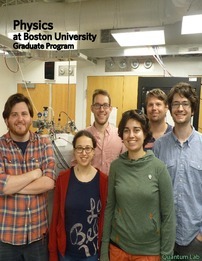 Thank you for your interest in the Boston University Physics Department. We welcome you to apply to our PhD Program. You will find that our students enjoy a community of diverse and amicable physicists from all over the world. We pride ourselves on the close contact between the students and the faculty, as well as between the experimental and theoretical research groups. Our students can take advantage of the close collaborations we have with the faculty and research labs of the College of Engineering, the School of Medicine, the Center for Polymer Studies, Neuroscience, Photonics and the Center for Nanoscience and Nano Biotechnology. Our distinguished faculty includes 20 Fellows of the American Physical Society, two members of the National Academy of Sciences, 4 AAAS Fellows, an American Philosophical Society Fellow, 10 Sloan Research Foundation Fellows and a Nobel Laureate. Unofficial transcripts from every college or university attended. Official transcripts will be required by the Graduate School if you are admitted, and upon your accepting our offer of admission. Official GRE General and Physics Subject Test scores. You should have scores sent directly to Boston University from ETS; Boston University's school code is 3087. Both general and physics subject scores are required. Personal Statement. Please write a brief essay describing your qualifications and objectives. Include any research activities, publications, and independent studies you have completed. Please See: Guidelines for submitting International Transcripts. Please visit the Graduate School Frequently Asked Questions page for more information about testing requirements. For more detailed information about the Boston University Graduate School of Arts and Sciences and the general admissions process, please refer to the Graduate School Bulletin. Application and submission of supplemental materials deadline (for fall admission): January 13th. A Bachelors Degree in Physics, or a Bachelors Degree in another field with comparable preparation in junior and senior level physics courses including quantum mechanics, intermediate mechanics, electricity and magnetism and statistical/thermal physis. What if I can't afford the $95 application fee? Boston University requires that the application fee be paid before your application is forwarded to the departmental admissions committee for review. We regret that we generally do not make exceptions to this policy, however there are a few exeptions which are listed on the Graduate School page. Can I arrange a visit to Boston University? Please contact the Physics Department main office at (617)353-2623, or send an e-mail message to Mirtha Cabello. Please call at least one week in advance so we can arrange to have several faculty and students available to talk to you. If you would like to sit in on a graduate-level class, please refer to our course schedule and let us know which course you would like to see. You can also refer to our research group listing and contact individual faculty members working in your area of interest. We particularly encourage students to visit on Tuesdays, when we hold our departmental colloquium. Directions to the Physics Department are available here. Is financial aid available? Click here for information about graduate tuition, fees and financial aid. First-year students typically receive teaching assistant positions. During their second year, students are encouraged to join a research group by applying for a research assistantship. Both research and teaching assistants receive a scholarship for tuition, fees and basic medical insurance, as well as a stipend. The stipend amount for this academic year is $23,340. In addition, students usually work as teaching or research assistants during the summer and receive an additional stipend of $11,670 for a total stipend of $35,010 for the academic year. All newly admitted PhD students will receive a 5-year fellowship offer, which may be a combination of a non-service fellowship, teaching fellowship or doctoral research assistant. See this page for more information. Please refer to the Graduate School's Admissions page for more info. For administrative questions, please contact our Graduate Program Coordinator, Mirtha Cabello.